Storming the Reich is a game about the World War II Allied campaign to liberate Northwest Europe from Nazi occupation. From D-Day to the Ruhr Pocket, the two great war-machines will fight until a winner emerges. Storming the Reich is a game about the World War II Allied campaign to liberate Northwest Europe from Nazi occupation. It is a game of brutal attrition and slashing advances. 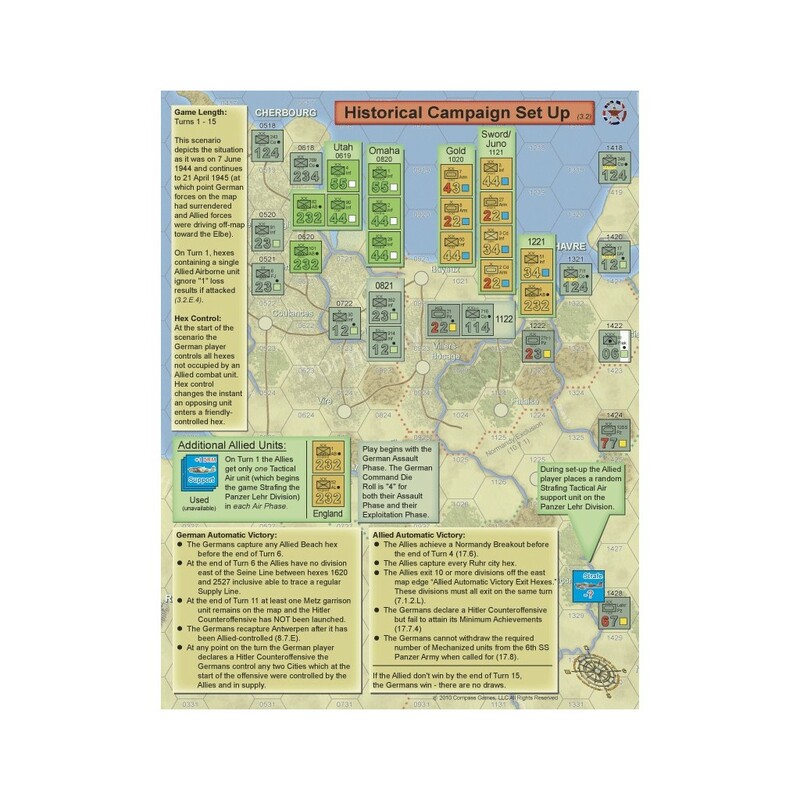 Opening on the evening of D-Day, with the Allies on the beaches and the Germans reacting (albeit belatedly) to the landings, the game covers the full campaign through to the battle of the Ruhr Pocket in April of 1945. With plenty of armor, paratroop divisions, naval gunfire, air superiority and even the 79th Funnies, the Allies will break out from the beaches and race across France toward the Seine River. To keep pace with operations they will face difficult logistical decisions including the grounding of units and Red Ball Express in favor of other operations, a surprisingly thin infantry leash, and whether to give Monty the lead in offensive operations over Patton (or vice-versa)… For the Allies there’s a chance at an early auto-victory for breaking out of the landing areas ahead of schedule, but they can quickly lose the game if they don’t cross the Seine on schedule. The German player will need to counter the Allied push with a healthy dose of reinforcements (admittedly of low quality), but with very limited replacements. They will need to take advantage of opportunities to thwart the Allies such as when Monty looks the other way at Antwerp, and they can even win the game, although not the war, by launching a successful Counteroffensive (aka. The Bulge). Careful use of Panzer Brigades and Tiger Battalions in offense and defense will play a key role in stopping the Allies. Storming the Reich is a two-map game with units portrayed mostly at division level (with some armored brigades and battalions). Each hex is about 8 miles across (or about 13km). Each turn represents a month of operations accept during summer where each turn is 2 weeks. 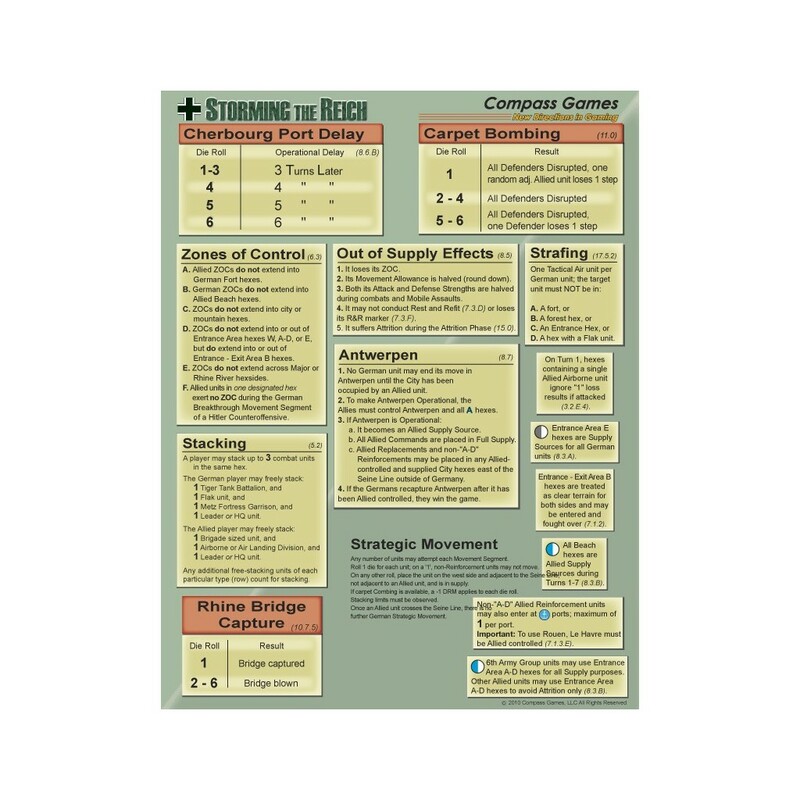 For players of Red Storm over the Reich, there are many similarities such as the variable movement allowances for both sides (a key feature for fog of war, variability, replay value, and solitaire play) and the same basic combat engine. A key difference is the elimination of the Redeployment Phase. There are 3 scenarios included. Scenario one is the full 15-turn campaign using both maps, beginning on D-Day and ending in April of 1945. The second is a one-map “Normandy Breakout” scenario – at only 4 turns it is a perfect learning scenario covering the initial desperate fighting following the landings. Lastly is a one-map “Bulge to Victory” scenario where both players really get to flex their gaming muscles.